The Whistler Nordics are pleased to present their annual ski SWAP on the Turkey Sale weekend. Purchase used cross country ski gear including classic and skate skis, boots, poles, or sell your used equipment. Local retailers also attend with great deals. Selling gear? 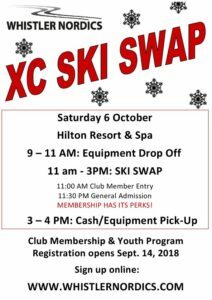 Drop off your used XC Ski equipment and clothing between 9-11am. Sale tags cost $2 each, but if you drop off before 10AM they’ll only cost $1! The club retains 15% of all SWAP Sales. Collect your cash or un-sold items between 3-4PM. Buying gear? Admission to the Ski SWAP is 11-3PM. Note that any unclaimed sales proceeds and equipment after 4pm will be considered donations to the club. The Whistler Nordics will deliver all unclaimed equipment to the Reuse It Centre to support the local community. Volunteers: Please email admin@whistlernordics.com if you would like to volunteer.